Accessories: You get a handful of tips, though I still find them a little on the small side. For small Chinese ears maybe? Whatever but the ones I’m really interested is the inclusion of a couple pairs of Comply’s so they are what I go to right off. Oh, and the ear guides and the little case. Build Quality: Rather nice, the cable is a great big step up on the original RE600 one, the jack too its some great lump of metal so phone screens beware. The buds are solid metal too so short of putting them in a vice they should be pretty sturdy. Isolation: For a dynamic, very good but…. not quite up to BA levels so if you have a Tube commute they wouldn’t be my first option but I repeatedly used on buses and on a couple flights quite happily. Should be enough for most people in most situations. Comfort/Fit: Excellent on both counts. Nothing unusual, rounded symmetrical buds that went in the ear with a shove and that was that. No venting issues and I wore for several hours at a time with not issues at all. Aesthetics: I have mixed feelings, I don’t love gold but I do like the matte sandblasted type finish. I would just prefer they were black or silver rather than gold but in fairness, I’ve just never liked gold. 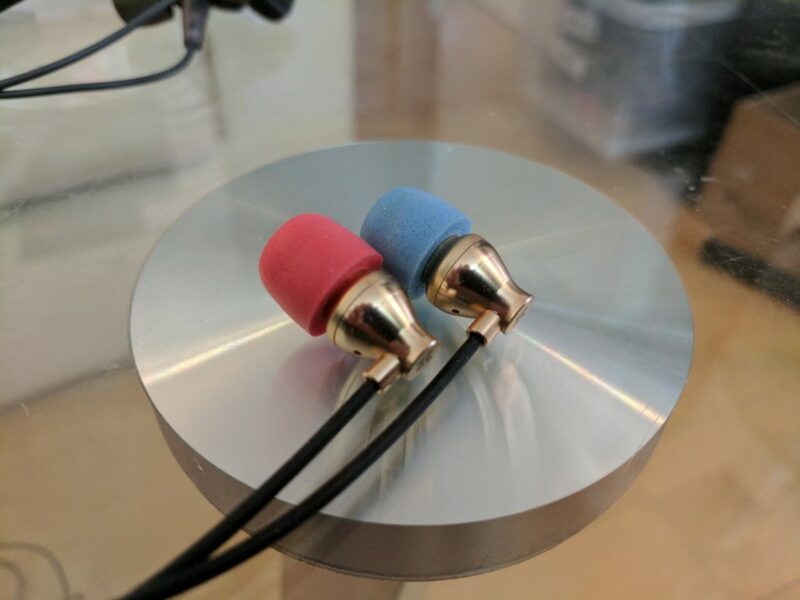 Sound: If I had made an IEM for myself, it would be more or less this. They have a slanted sound signature to the bass and a little subdued in the treble but that works perfectly for me. If you’re going to listen to for hours on end you need something easy on the ear and these are. They are rich and mellow, so smooth and with such clarity they make everything look effortless and easy. The bass is superb, so sculpted you can practically reach out and touch it. The mids are a little touch back in comparison but have such a broad scope, such an incredibly natural texture and tone to them. Male or female, oh good god and strings, strings are so fantastically good. The timbre, the tactility, I cannot just feel the strings vibrating in my hand but I can feel what it is to be the string like I’m staring into its soul. It’s strange and freaky that you can just lose yourself into what is nothing more than a harmonic wave. Granted you need some extremely good quality music to really abandon the outside world and create your own mini heaven as you trundle into work or wherever. Everything sounds so real and dreamy and captivating yet it makes it all look so completely effortless. It feels so relaxed and confident in its paragon like virtues you really need to spend time with it and explore what it can do as it’s so completely non-attention seeking in its presentation. It is simply wonderful sounding. Value: Wallet ouch yeah but have a listen then it won’t seem so much. Pro’s: Sublime. Sonically capable to such a degree, tone and coherence it puts others to shame. Con’s: Won’t have enough treble for some tastes. Isn’t very aggressive.